Do you remember your favourite experience doing charity work? I’ll always remember my favourite moment as a Basket Brigade Volunteer. It was Thanksgiving and jacket weather, the sun was out so it was warm enough that we didn’t need gloves. My brother Tony was driving his company car since it’s an SUV and, well, we’re doing god’s work, so someone else can pay for the mileage. 😛 Hahaha! He pulled off the main road and into a townhouse complex. As it goes with affordable, high density housing, it’s often right off a busy street with four to six lanes of traffic. The houses are close together, the lots are maybe 20 feet wide, single lane driveways. We drive slowly going over speed bumps as I’m looking for the house numbers. We find the house and pull into the driveway. It looks like all the rest of the houses, but with toys on the front lawn. This complex looks to be a condominium, as they all look the same and were built in the 1980’s. They’ve been maintained OK, but they haven’t been painted in a while and I can see some tattered window screens. Our list of deliveries details the family as two sisters sharing a house each having kids for a total of five kids, the oldest is nine, youngest is 24 months. Single moms have a special place in my heart as, statistically, single moms have the highest chance of living in poverty of any household. I’m a parent too, and know how hard it is. I couldn’t imagine being on my own with a single income. My brother Tony and I grab boxes and bags of groceries, including a turkey, fresh fruit, vegetables, bread, butter, eggs, everything you need to entertain family for Thanksgiving dinner. We carry the groceries from the trunk, walk up to the front door, knock and are greeted by yelling children. They are excited to see who’s coming and are jumping up and down with smiles to greet us. One of my the moms comes around the corner to greet us. She’s dressed comfortably in sweats, as everyone does on weekends, and she has a kind but tired smile and says thank you. The mom hugged both my brother and me. The kids are looking through the packages we brought. The box and bag we brought are heavy, so the kids are grabbing items, lifting over their heads and yelling what it is before carrying it off to the kitchen. We inform her we still have more and need to make another trip to the car. My brother and I return with more groceries and some used kids books that were donated by another volunteer. One of the kids screams “pie! !” and “oh look! BOOKS! !” Two of the kids help themselves to books and go outside to read in the sun, the other kids run outside to play on the lawn too. We exchange hugs with the mom again and wish her a Happy Thanksgiving. Tony and I return to the car and sit in silence for 30 seconds before turning on the engine. Taking in the experience of making a difference for a single mom and kids who are so grateful for so little. My brother says something along the lines of how great it feels to help out this family. I’m the passenger/navigator, so I check the list and key in the GPS for our next delivery. A simple act on a fall day with my brother and I’ll never forget it. Life is about experiences after all. This was the moment I knew we were onto the best volunteer experience ever and I got to share it with my big brother. I knew we had to bring it back to Hamilton. This was six years ago and, with the help of many others, I went on from being a volunteer to building and presiding over the biggest operating budget for a Basket Brigade charity. It’s the only Basket Brigade that operates Easter, Thanksgiving, and Christmas anywhere in North America. People need help and we will be the change they need. This Easter, 32 of Hamilton’s poorest families will have their wishes answered. Our volunteers are sending home wish lists for the families to fill out and our volunteers will receive completed wish lists with the family’s story to go shopping. We budget $100 per family member. On April 20th, we throw a party with pizza, hot dog cart, DJ, Batman, and free giveaways for all the families. It is here our volunteers will arrive early to wrap presents and hand them over to the families. Those families who can’t make it in person, will have theirs delivered by volunteers, but can you see many families missing out on this party?? April 20th, we will be the change we want to see in the world. We will have an Easter bunny, Batman, Marvel Avengers Thor and Valkryie, pizza, hot dogs, DJ. It’s a party for 32 of Hamilton’s most impoverished families and our volunteers. This week’s guest is an old friend who is the newest member on my team, Paisley Mackenzie!! I first met Paisley back in 2011 when I started looking into Brantford, as it was and still is a top town for investment. A best practice when learning about a new city is to meet with the Economic Development Officer, and at the time it was Paisley Mackenzie. FOR FREE, I was able to bounce residential investment opportunities off a local expert with over 20 experience in business and real estate in the city. We hit it off immediately, since Paisley is kind and very helpful. In me, Paisley could tell I was not like other real estate agents, as few out of town residential agents ever come to meet with her looking for the best opportunities for their clients. Paisley is now the former Economic Development Officer with 28 years experience in that role. 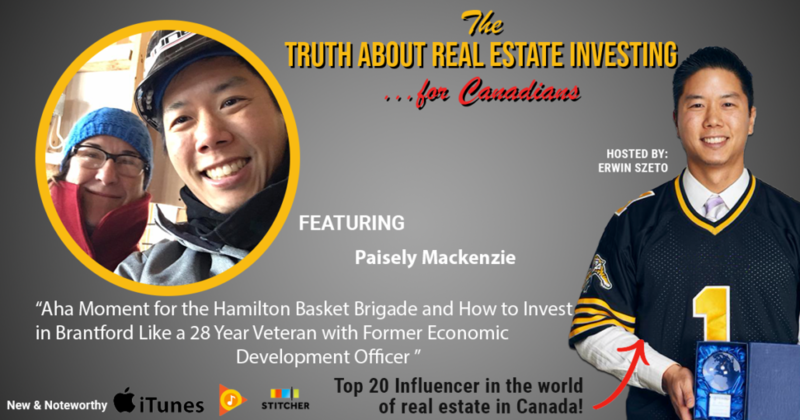 Her job was to work with investors and businesses who invest in Brantford, and she’s now doing the same as a member of my Titan Investment Real Estate team as a coach to guide and teach others to invest in Brantford, Hamilton and surrounding areas. Her knowledge of commercial and industrial real estate is second to none, but enough from me, I’m proud to present to you Paisley Mackenzie.